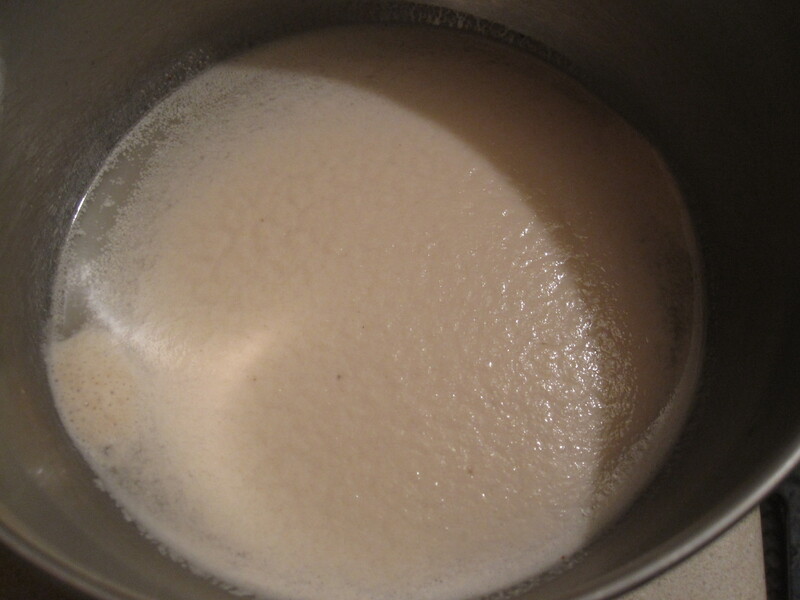 Starting from the very beginning by using this common yeast and mixing it with warm sugar water to activate. 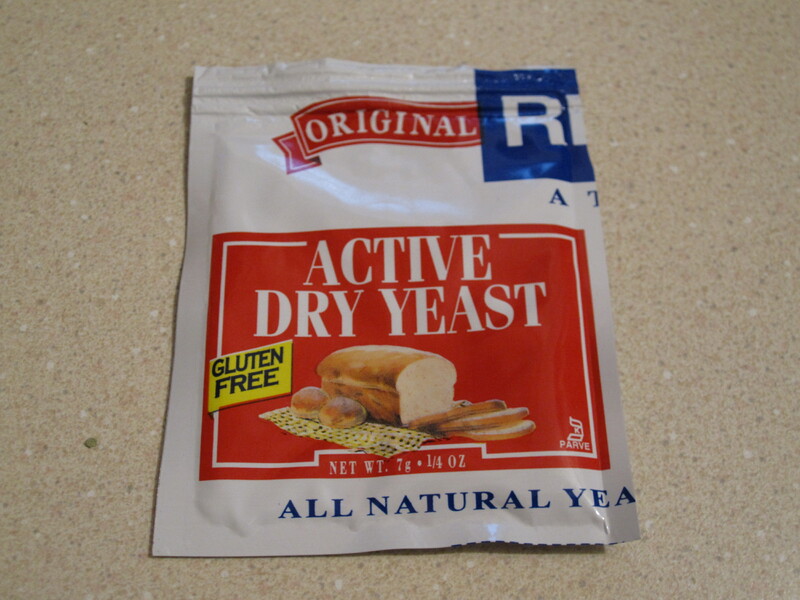 After about 15 minutes the yeast was active and ready to move on to the flour. 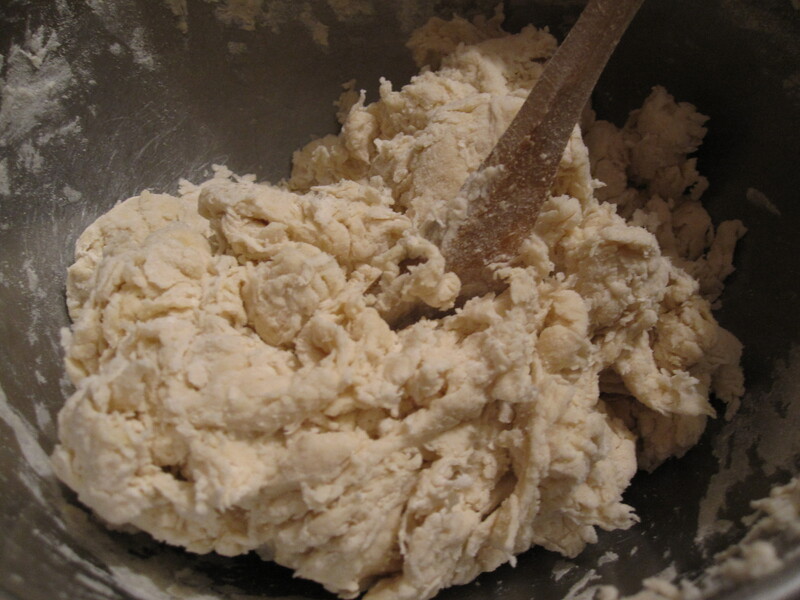 Add the flour slowly while mixing, but it is a messy job no matter what. 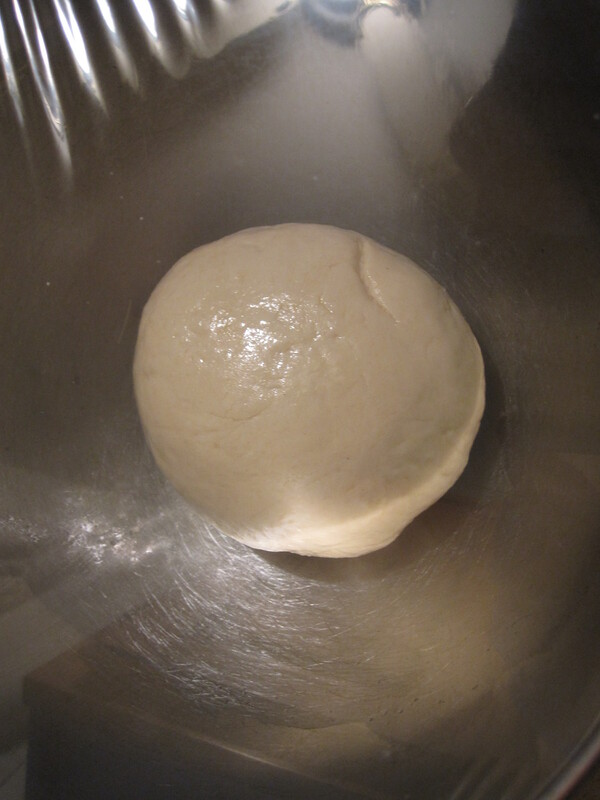 Once the dough is formed enough, use well floured hands to move the dough ball to a well floured countertop (getting the well floured emphasis?). 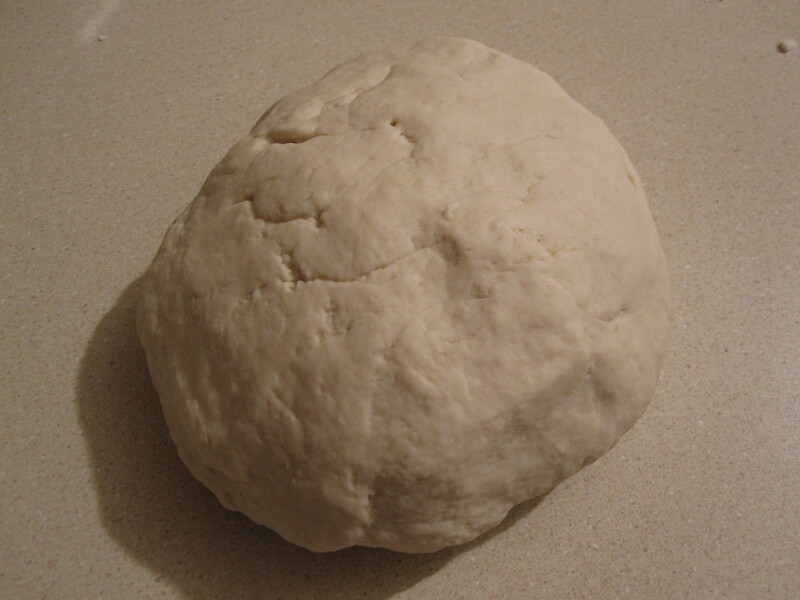 Knead into one solid ball that starts to get smooth and almost a bit dry on the outside, but do not overknead or your dough will become gummy, difficult to work with, and generally bring the whole product down. 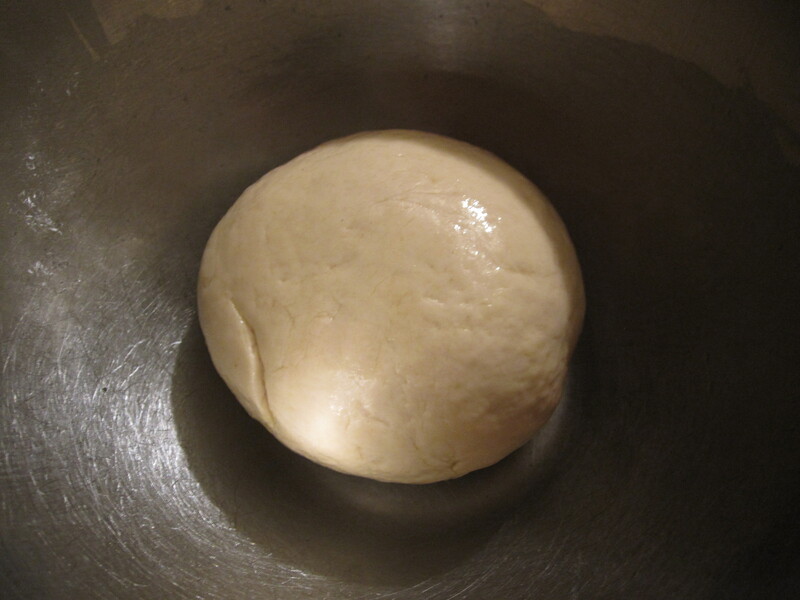 Split this large dough ball in half and place each in a bowl with a bit of olive oil. Roll the ball around by spinning the bowl until covered with the oil and cover the bowl tightly with plastic or a lid. 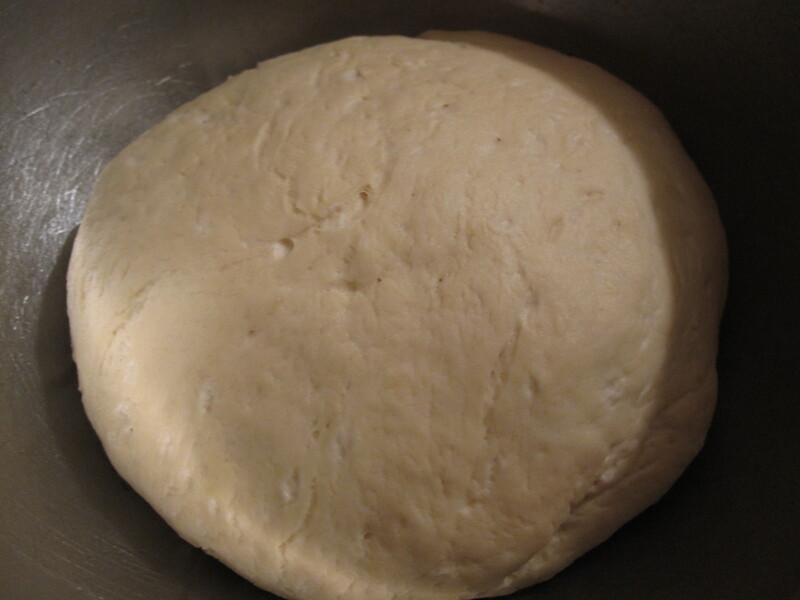 Let the dough rise at room temperature for about an hour and a half. It will about double in size as you can see in the above/before and below/after. 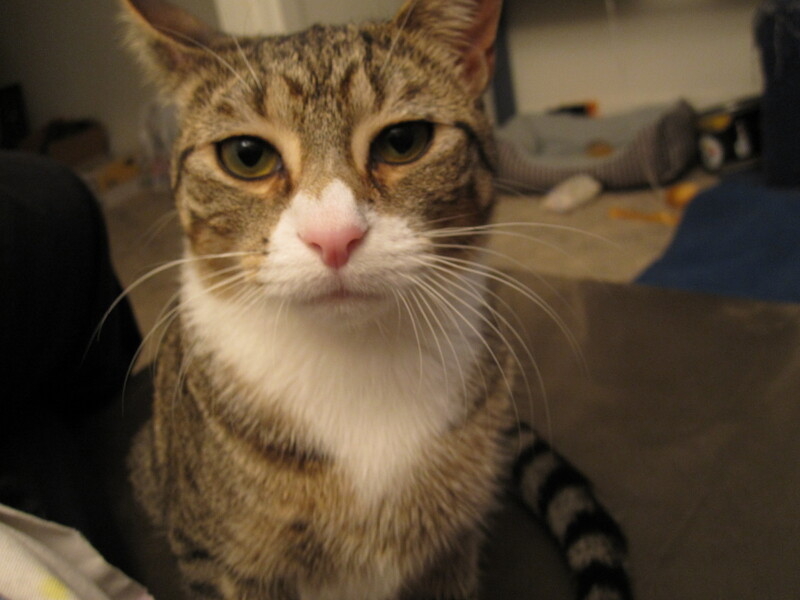 I took this picture of Maddie while waiting for the dough to rise and it just cracks me up so much that I had to share it. 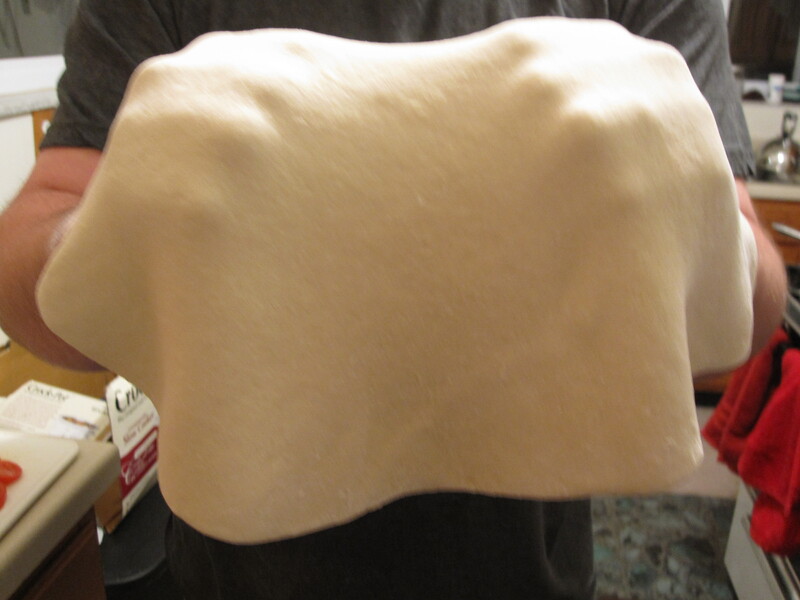 Anyway, when using the premade frozen dough, we were never able to fully achieve this important phase of the soft, pliable, room temperature dough. This was so much easier to work with and appropriately form….and even show off a bit as if you were the one tossing the pizzas in the streetfront window. 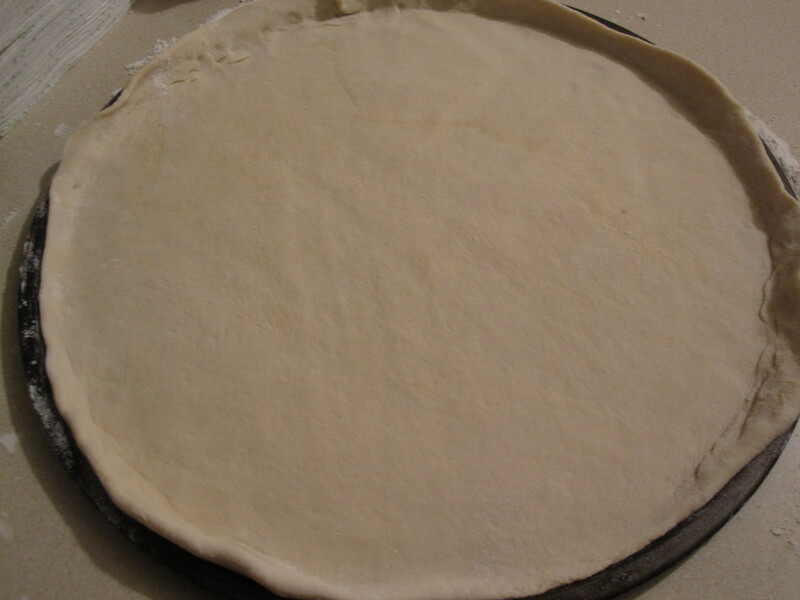 I preheated the oven to 400 and started to assemble the pizza on an aerated nonstick pizza tray. My mom recently gifted us with a groupon for Donatelli’s Market in Bloomfield, the Little Italy of Pittsburgh. So we went and quickly and easily racked up $50 of meats, cheeses, salads, and fresh and frozen housemade items. 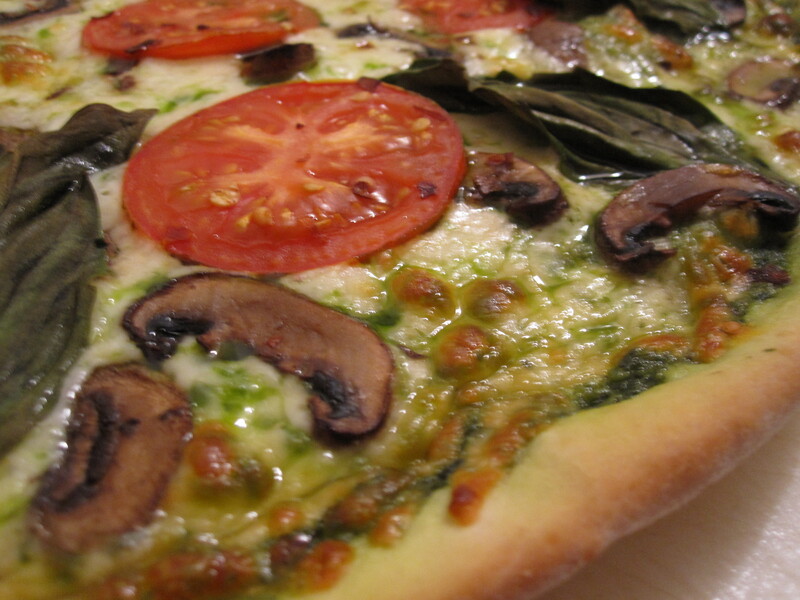 One of these was pesto which we used as the main sauce for this pizza. 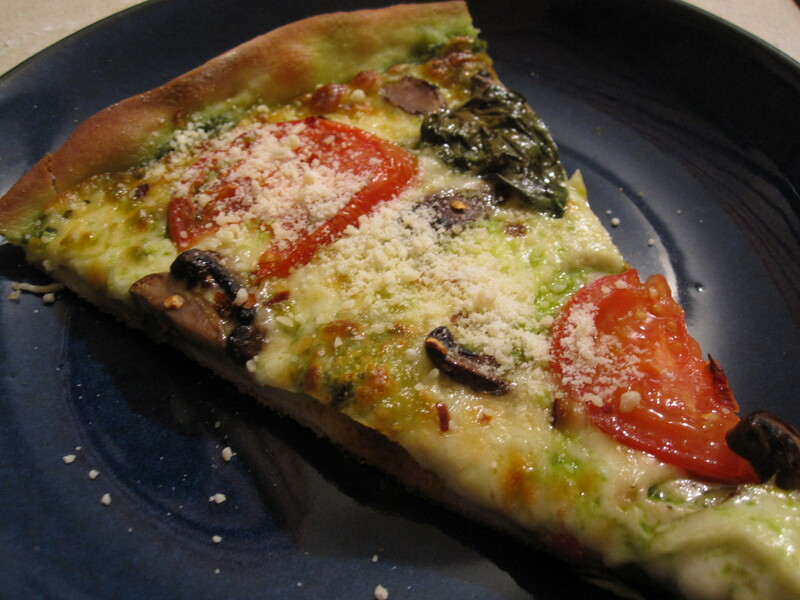 Then sauteed baby bella mushrooms on top of Donatelli’s mozzarella. 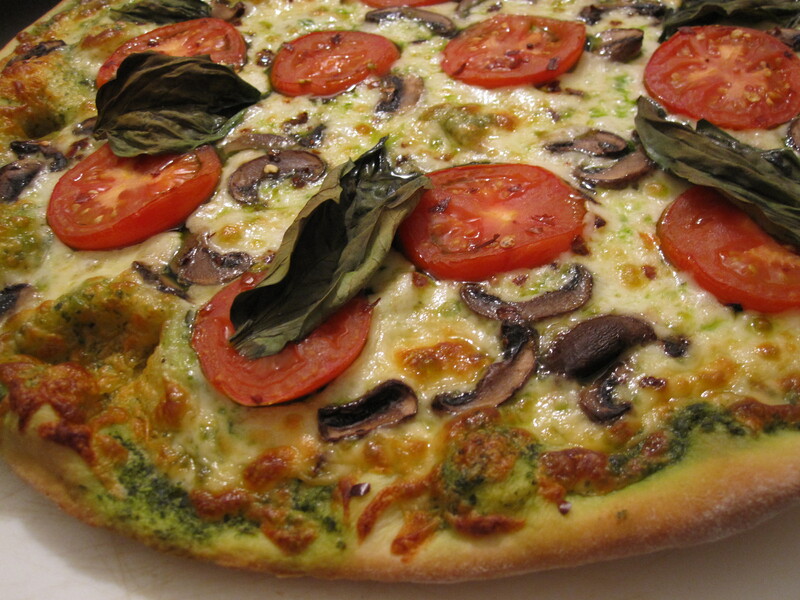 And some fresh basil. I can’t wait for warmer weather and my own basil! 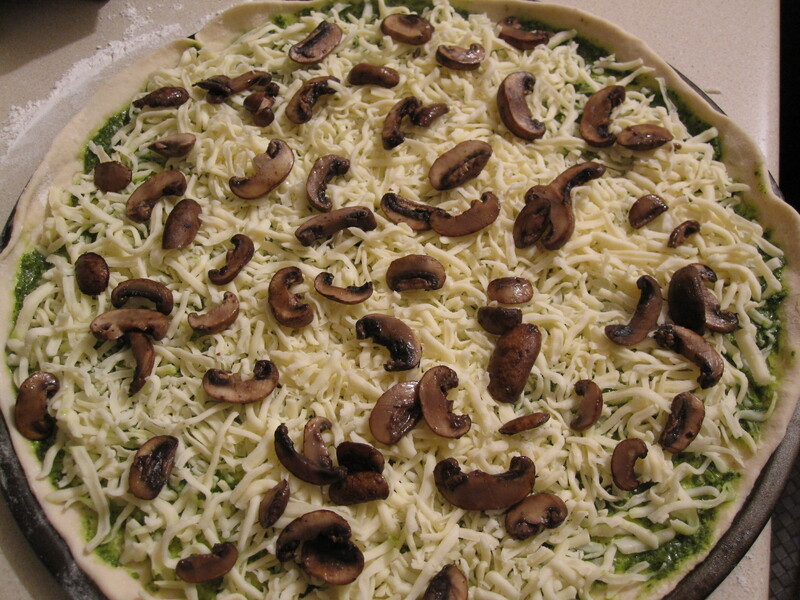 Then into the oven for about 12-15 minutes. Better to check it too early than too late! 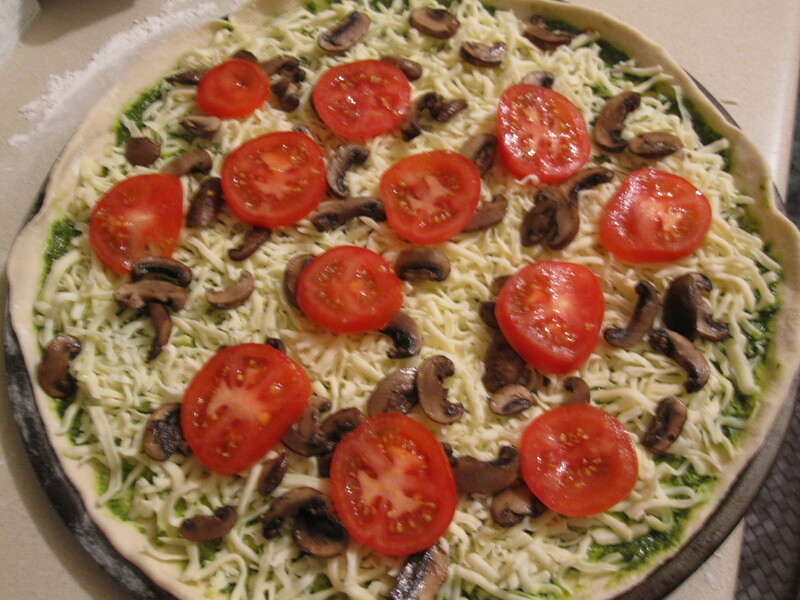 This entry was posted in Pizzas and tagged Aiello's, baby bella, basil, Donatelli's Italian Market, flour, homemade, mozzarella, mushrooms, Pesto, pizza dough, tomato, yeast. Bookmark the permalink. 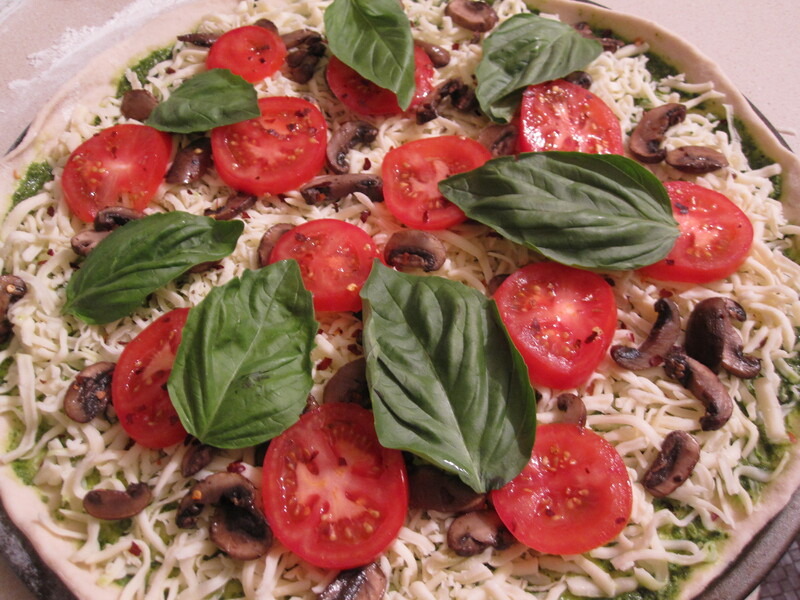 a tip we found is to dip the basil in the sauce before putting on top (like into the tomato sauce). 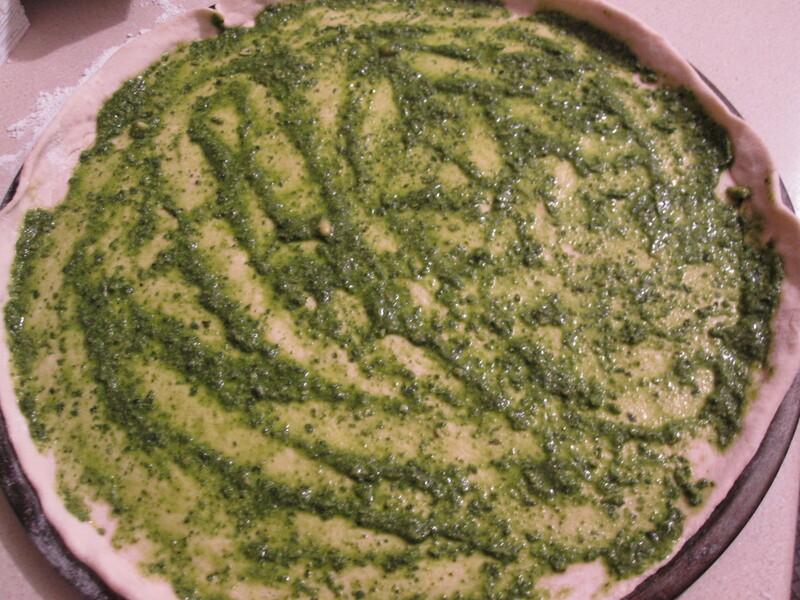 haven’t tried the trick with pesto, though. 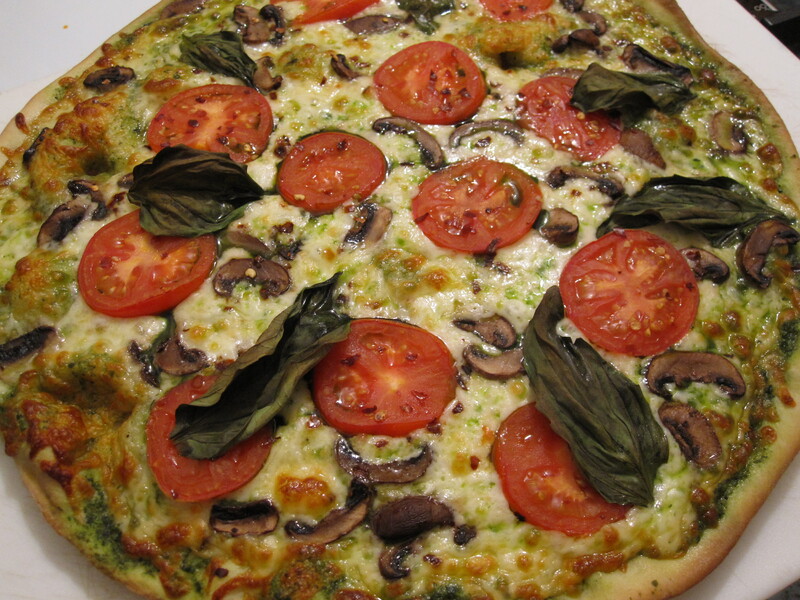 ANYWAYS, it helps prevent the basil from burning. CHEERS!